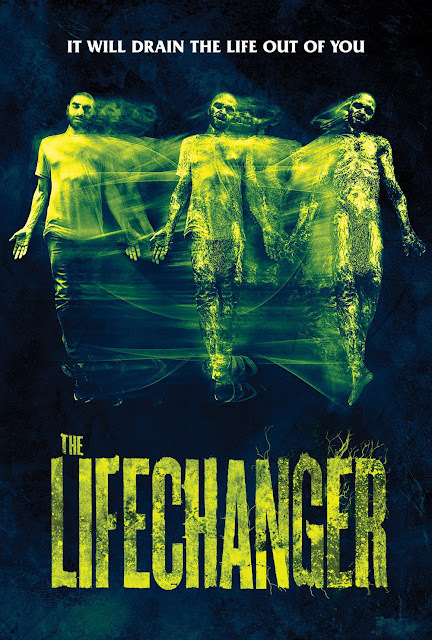 Lifechanger is about a lost love and the need to reclaim it at the expense of all others and it is all entwined in a body swapping tale. Drew (Oberst Jr) - whom we only ever hear in voice over - is jumping from body to body; he has to do this to survive. The one thing that is his constant however is his need to be with Julia (Burke), only problem is he can never stay in a body long enough to get any meaningful time with her. As his host rots, he has to find another body to jump into before its too late - it's not that he wants to murder people but just that he wants to survive, for the chance of being with Julia again and so Drew is stuck in sick repeat cycle. Writer/Director Justin McConnell has written a really minimalist and thoughtful thriller, there isn't much in the way in the way of answers for why Drew can do what he can do but the film isn't really about that. It is about Drew and his pursuit of Julia across bodies and how his relentless chasing destroys so many other lives in the process. It doesn't dawn on Drew about what he is doing to others until he comes face to face with his years of body swapping. The direction suits the story as it is kept very low key barring a couple of really cool tracking shots. Lora Burke plays Julia with a real degree of sadness and weariness; it is a very fine performance. A woman who lost her husband (courtesy of Drew body swapping into him) and has been trying to cope with that since and Drew keeps on floating in and out of her life giving her fleeting moments of happiness (which is a very cruel thing to do). Drew's various bodies that he jumps into are all good too, always taking on a few similar traits and I think that really helps sell the body swapping. Driven by a nice score and one really amazing effects scene Lifechanger definitely plays on your mind, not through its violence but through the thinking that if this were your life and you had this ability how would you use it? Drew says that he loved Julia and just wanted to make her happy but if he really thought about things, he was really only trying to make himself happy, as he knew that his time with her would only ever be fleeting. As they say in the classics if you love something, set it free. Lifechanger is available on VOD now.